VC Poker is based in Gibraltar, and is one of Europe's (specifically UK) fastest growing poker rooms. They are a famous and trustworthy bookmaker (since 1946) and have a unparalleled reputation for integrity and honor, all core values to operate successfully within the online poker industry as well. As written on their website, their poker room's mission is to provide you with the most enjoyable online poker experience by providing innovative poker games within a secure, safe, and fair environment. According to us, this seems to be a legit statement being part of the iPoker Network. The "no flop, no drop" policy at VC Poker means that they only take rake from hands where the flop is actually seen. Generally the rake is between 0% and 5% of each total pot, with an average cap of $2 up to a maximum of $5 at the higher stakes tables. You will earn Action Points when playing poker frequently at VC Poker, which you can use to buy your way into free satellite tournaments, as well as into some of the biggest land based tournaments in poker. The smaller freerolls are perfect for new players that are looking to build up their poker bankroll from scratch. In the following part of our VC Poker review you can read in-depth information about VC Poker's client, website, security & integrity, traffic & games, bonuses & promotions and support. The VC Poker client is developed by PlayTech and runs on the iPoker Network. It offers all the industry standard features to make sure that you as a player experience poker as it is meant to be, simple and easy to use. PlayTech releases new features all the time, these are listed per release on the VC Poker website under Support > New Client Features. The table layout is very clear and has big buttons that enable you to execute your actions quickly, i.e. fold, check and raise. Just above the buttons you can find a slide bar to increase your bet or raise, but also a few predefined bets (2x, 3x, pot and all-in). When shoving all your chips to the middle, the client will also show the all-in odds for all players involved in the hand. You can play up to five tables simultaneously and the sizes of the active tables can be changed to mini view - so they will fit on your screen. It's either none, or all, meaning you are not able to change the size of only one table. In the options menu, you can select if you want to see your folded cards. If turned on, the cards will be displayed only to yourself, in the bottom right corner of the active table. The cashier within VC Poker's client is one of the better we've seen. They made it really easy to deposit (it shows minimum and maximum amounts per deposit method) or submit a withdrawal request for your preferred payment method. Registering at VC Poker through one of the links on PokerBonusHelp.com gives you the option to pick an improved first deposit bonus of 300% up to $600 (regular bonus is 100%). The bonus at VC Poker clear a lot quicker and easier than the bonuses at most other online poker rooms presented on the iPoker Network. The exact details can be found on the VC Poker website, where they compare VC Poker's points distribution system against some other online poker rooms. Being part of the iPoker Network you are guaranteed to see promotions all the time, including satellites for land based events such as the European Poker Tour or the World Series of Poker. Besides satellites to live tournaments, you can participate in several online competitions, such as the European Championship of Online Poker (ECOOP), which returns several times per year. The ECOOP for example is a range of online poker tournaments where winners will receive a real diamond bracelet next to their money prize. VC Poker also has its own promotions. The most frequent one (and still very worthwhile mentioning) is the Beat Victor promotion, where Victor Chandler himself brings money to the table giving players a chance to win. This promotion exist out of four challenges (two online, two live) and ultimately ten players will play the live final (3rd challenge) in Spain for a share of $50,000. The fourth challenge is privileged to the player that wins the 3rd challenged and he will play heads-up against Victor for another $50,000! If you need a VC Poker bonus code, comparable to referral codes for online poker rooms such as the referral code for Absolute Poker which grants you AP's bonus, you can make use of PFF600. VC Poker is a UK licensed operator. They are a company incorporated under the laws of Gibrartar, a jurisdiction approved and white listed by the UK government, meaning they fully are licensed and regulated to operate an online poker room. The security of your collected data at VC Poker is taken very seriously, all of it is stored in a secure and protected environment. You can rely on the fact that all reasonable steps are taken to ensure that any processing of your data will adhere to the strictest standards of security and accuracy. Also, your private information will not be sold to any third party. 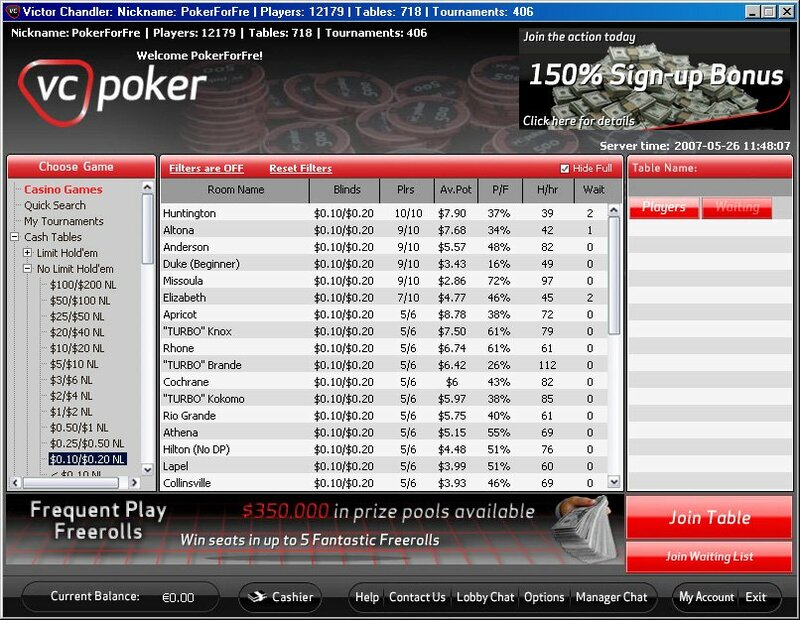 Most traffic on the iPoker Network, thus also on VC Poker can and will be found at the Texas Hold'em tables. This is simply the game of poker that players around the world love. Though, if you are looking for Omaha (Hi, Hi/Lo) it might just take a little longer, but you certainly don't have to worry about finding yourself a table that suits. Occasionally a full table of 7-Card Stud may be found, but this will definitely be a lot harder. All of the previous mentioned poker variants are available as tournaments, as well as cash games, of course in the usual betting structures Limit, No-Limit, and Pot Limit. The VC Poker support team provides world class customer service. First of all, they are easy to reach using the in game chat feature. Besides that, they offer their support in many different languages which enables you to get an answer to your question or a problem solved much faster than regular, whether you are talking to them by chat, over the phone, or by e-mail. 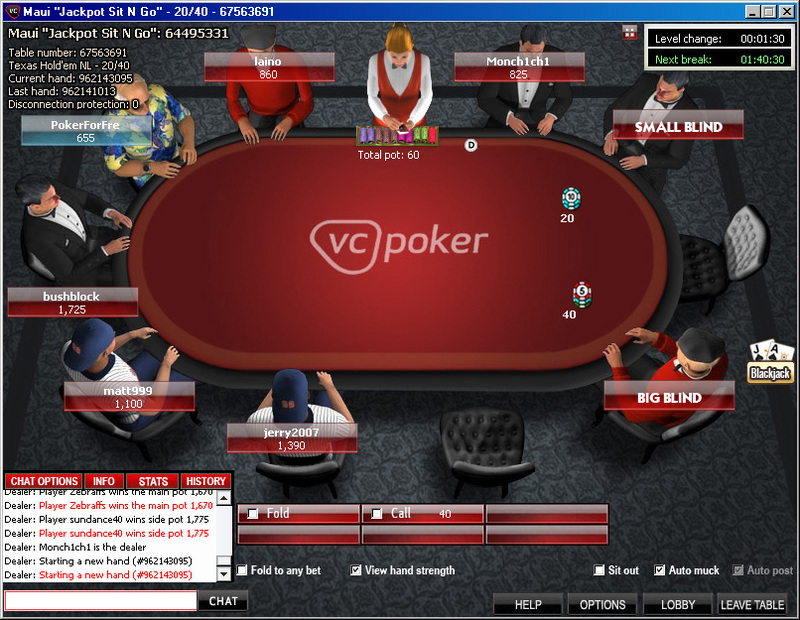 VC Poker offers the ability to call for a chat manager at the table, who can assist you during a poker session.